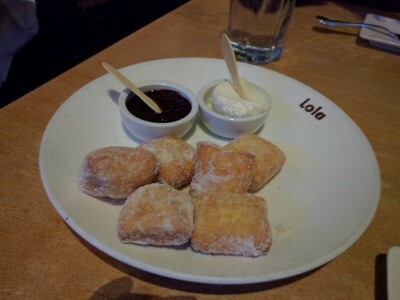 The third Tom Douglas restaurant we tried while in Seattle was Lola. It's described as,"Lola features the classic produce of the Pacific Northwest mingled with cooking styles of Greece; the menu offers modern Mediterranean and North African riffs on local ingredients such as Anderson Valley lamb, Penn Cove shellfish and wild King salmon." We made reservations for a Sunday and were seated right away when we arrived. 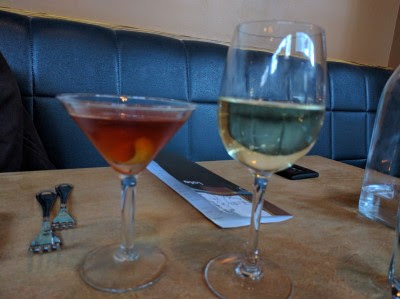 For beverages, SP chose The 4th Ave (rye, local cherry bounce liqueur, amoro, benedictine, bitters) and I chose wine (Lola white, small carafe (8.5 oz)). We both really liked our choices. 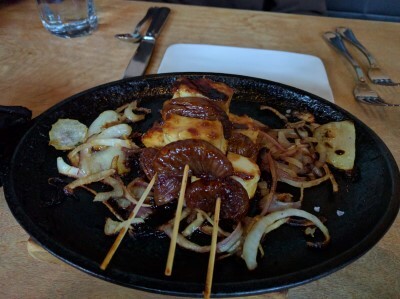 We started off by sharing Haloumi Cheese Kebab (kalamata fig, fig balsamic). I'm still trying to decide whether or not I really like figs (I waver on it) but this sizzling plate was delicious. Lots of charred onions to go with the figs and cheese. 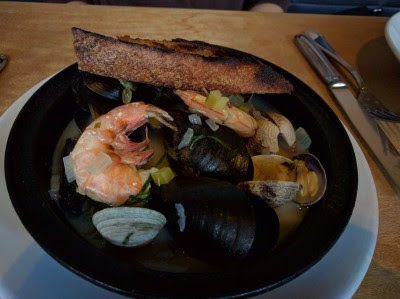 For his meal, SP chose Northwest Shellfish Kakavia( clams, mussels, prawn, fennel, celery, ouzo, grilled bread). As always, he enjoyed his seafood medley. Since the lamb dish I had my eye on had lots of garlic in it, I instead opted for Braised Beef Shortrib (ricotta dumplings, braised greens, roasted garlic yogurt) without the yogurt. 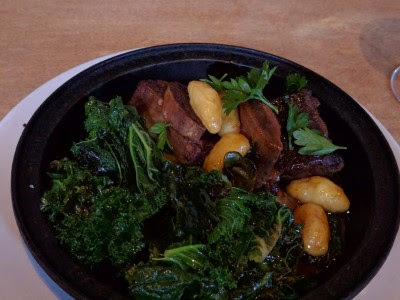 The dumplings were amazing and the shortrib was pull apart tender. We couldn't agree on dessert so we ordered two. 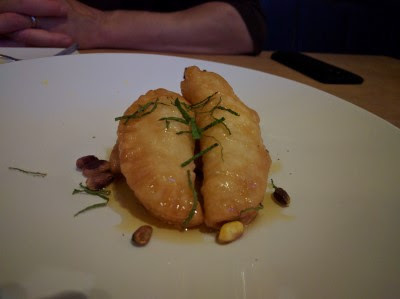 The "SP dessert" was Goat Cheese Turnovers (honey, mint, pistachios). He thought they were fantastic. I liked them, but they're not really my kind of dessert. This is my kind of dessert: Breakfast Doughnuts with raspberry jam and vanilla mascarpone. These are maybe the best doughnut dessert I've ever had. The mascarpone with the jam smushed on the pillowy fried dough was heavenly. I'd go back just for these doughnuts. 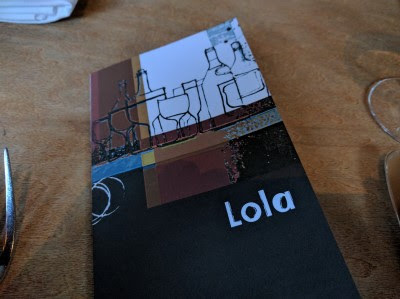 Lola was another great dining experience in Seattle and probably my favorite of the 3 Tom Douglas places we tried. Relaxing, great service, delicious food and drink, within walking distance of our hotel. We'd go back next time we're in Seattle.